Mark your calendars: Wassail’s upcoming cider dinner will showcase hard cider from two exceptional cideries—plus a few exclusive releases! On September 13 from 7:30–9:30 p.m., enjoy a special cidermaker’s dinner where a four-course meal will be paired with ciders from both Oliver’s Cider and Angry Orchard Cider. 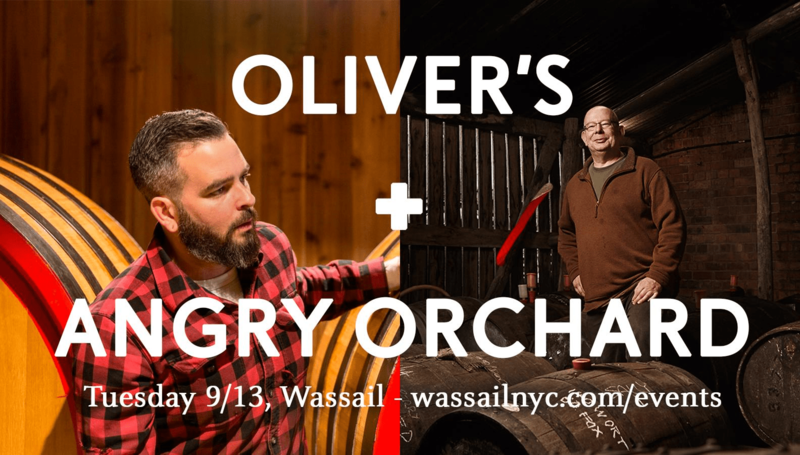 Meet cidermakers Tom Oliver of Oliver’s Cider and Ryan Burk of Angry Orchard at this special dinner and taste six different ciders provided by the cidermakers themselves. Special note: this is the first time that Ryan’s vintage ciders, made with the mentorship from Tom, will be available for tasting! The cost to attend this special cider dinner at Wassail is $65 per person, excluding gratuity. Save your seat online. Find Wassail at 162 Orchard St. in New York, NY; phone: (646) 918-6835.